Objective of Attention Test I is to test your ability to concentrate in a monotonous setup. Two symbols are displayed on screen one below the other. The symbols are displayed either in a dark or light grey scale. 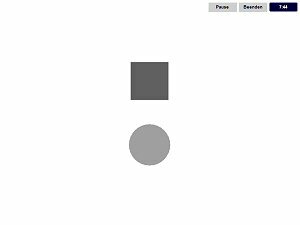 Whenever one of the symbols is displayed in a consecutive light grey scale you are to respond to this event.